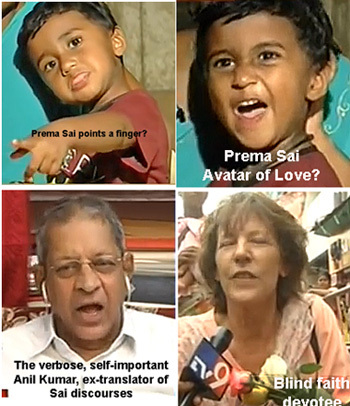 The newslady gives a recap about the boy named Preetam, declared as Prema Sai. She says some believe and some say there should be an announcement by the Trust if it is really true. 1:00, Newsman Lakshmi Kanth reports from Puttaparthi: he asks a lady selling flowers what she thinks, does she accept the boy as Prema Sai? She said if he comes here than she’ll have faith, not before. She keeps repeating that she won’t believe until she sees him in person. 2:43, A foreigner is asked if she believes. She explains in English that she believes in time that he will really come but for now, she just believes in the Prema Sai in her heart. An elderly Indian devotee is asked if he believes. He says Prema Sai should be born after the 96th year of Sathya Sai, not before. He thinks what is happening now is all for money. He mentions other scams that happened with some guy near Hindupur and another on the way to Bangalore (indicating Muddenahalli?). Those who believe are stupid, he says. 5:33, Mother Tejamani is brought on again, to ask her (in Kannada) about what Puttaparthi devotees think. She says she is also watching and won’t fully believe until a few years has passed and if the boy does miracles as promised. The news people agree she is an innocent, honest woman and the whole drama is concocted by the Manipur devotees and Srinivas. The talk about how even her head could be turned by the adoration of the devotees and the special privileges they will get. 8:52, Anil Kumar finally comes on, the newslady asks about his first reaction. He says first he was surprised and all the devotees are eager and expectant about Prema Sai coming and are jumping to conclusions too quickly. He praises the cute little, normal boy and the innocent mother. He says each needs to have their experience and not just believe in what others say. He says based on what the mother says and how the boy acts, he has serious doubts about him being Prema Sai. 14:44, They try to get Anil Kumar to ask Srinivas questions but apparently the audio isn’t working, Anil Kumar cannot hear what the studio peopleare saying. Instead, discussion amongst the guests in the studio ensues. The commentator lady suggests they consider that this might really be true; we have heard of a ‘child progeny’, is it possible that he is one? One consultant guy says it may be possible to consider if he takes after one of his parents, say if the parents are good looking, the child may get those traits too. But, it is a mistake to think he can just get special qualities saying it is from some past life. 15:30, Another guy says even the boy’s own parents accept that there’s nothing special in him. What’s happening is all because of the pressure of others coming in and declaring that he’s god. They want benefits after declaring him as special. If he is special, he can declare himself later on. The lady agrees, why is everyone pushing the announcement now instead of waiting? 17:38, TV Rao is introduced and asked for his opinion. He says in the Hindu religion there is no mention of man being god. Sathya Sai is all about tricking the public. The Central Trust is behind all these attempts to fool the public. The lady says the Trust hasn’t announced anything about Preetam being Prema Sai. Rao says that is just a secret, after some time they will agree and promote this Prema Sai. >19:50, Anil Kumar asserts that the Trust has no opinion about this so far, as far as he knows. The lady asks if he believes that when Prema Sai really comes, will an official announcement come through? He says NO. He said the Trust is all about maintaining the org and ashram as it is now, but they have no spiritual authority to announce when Prema Sai comes. Anil says that people come and form their own opinions after seeing and even worshipping the boy in person. Other than that, belief doesn’t just come from hearing from afar. 23:20, The lady asks if Anil Kumar believes that Sathya Sai said he would be reborn at a certain time, in a certain place. Anil says Sathya Sai never said such a thing and as long as he was alive, this question did not come up. About 20-30 years back, he said Prema Sai will be born. After a few years, he also said that Prema Sai MAY be born in Karnataka. He also said Shirdi was the embodiment of Shiva, Sathya Sai was Shiva-Shakti, and Prema Sai will be the embodiment of Shakti. Now 30 or 300 people may come to worship because others declared he was an avatar. I could even declare my own grandson as one, then the same thing might happen! 25:09, The lady asks how the name of the village Doddamallur came to be known? Sathya Sai never said anything like, “I will born there, I will be in a village, these will be his parents, I will show the boy when he comes”. Anil Kumar says, I am speaking what I feel only. Right now, according to Sathya Sai’s teachings, this life is enough, there’s no need for Prema Sai. What is known and making the life blessed is the goal of life, that is what I feel. 26:28, Narendra says he does not believe in rebirth. However, there is another research being done and he’s interested in that but as of now, he doesn’t believe. If there is rebirth then how to decide whether one is born again as a human or as a dog? The commentator lady says according to one’s actions it is said one has rebirth. Narendra says what about a dog that just lives its life, it doesn’t sin. Then how to say it is born again according to its actions? 28:53, Asks that if the human birth is the highest, then what comes after a human birth? Ramesh answers there is no past or future births. When a baby is born, it is only related to the mother and seed of the father. 30:26, Takes a phone call from USA from Chaitanya, he is asked how he feels about the news of Sathya Sai being born again. He says it makes him laugh a lot. He says people can say anything but how can we believe. He says there is nothing after death, what is left over after the body dies? Nothing is left. He says Sathya Sai told many lies and deceived the public in many ways. Several people were killed in his bedroom, due to political clout nothing came of it and no one was punished. Sathya Sai is dead and it is impossible for him to come again. It is nonsense, not only with Sai Baba, but no one is born again. If they would have arrested Sathya Sai then the truth would have come out. 33:03, The lady asks him a final question, saying people are worshipping and believing in the boy, others from Andhra might go and worship there, what is his advice? He says, there is no support for the claims and no honesty, don’t have faith. This is not based on scripture. There’s no scientific method. It is a mistake, don’t do it. 38:10, Ramesh mentions several unrelated subjects in quick succession: holy man doing this or that in various villages, then says we aren’t talking about them. We’re on one subject here. Shirdi Sai Baba didn’t want anyone to worship him. Science says there’s no reincarnation. You mentioned about all the service done by Sathya Sai, why didn’t you mention about the murders that happened and why no one was punished for what happened? There’s a child in the village that they are presenting as Prema Sai, the reincarnation of Sathya Sai. Talk about that and not other things. Do you believe in him or not? Just concentrate on one thing here. There are so many so-called holy men who have deceived the public, but you defend the whole thing like a dog trying to bite everyone. There’s definitely no past lives. So many people try to make excuses, saying that people are in bad situations because of what they did in past lives, saying past lives, saying karma. Is that boy Prema Sai or not? 47:50, She asks Ramesh what he feels will happen in the future. He says based on the boy and the mother talking with him, they are innocent and have nothing to do with it. The Manipur devotees and Srinivas are pushing the worship of the boy and promosing to build a temple. I have seen many of such cases, of them changing the lives of small innocent kids. I can also teach the boy how to do magic tricks if you leave him with me for a couple of months. I am afraid what they will teach him ashe grows. There is selfishness behind what they are doing. What is the need of taking that boy to Manipur and promising to build a temple? People will always believe and follow if someone declares something. 51:36, Asks TV Rao for his final thoughts. God being born, God dying, God being reborn, these subjects aren’t even present in Hinduism. Only people who do bad things have to come back, good people go to heaven. The subject of God being born again, we need to blame the people who declare that, not naive innocent people. Shirdi Sai was a Muslim, they made him a Hindu Baba, then Sathya Sai comes putting the symbols of all religions like Christian and Muslim, students aren’t studying in his schools for free, they are paying fees. If we want to protect the Hindu religion then first of all, we need to stop supporting such cheaters who amass millions of dollars. 53:45, Asks Srinivas for his final thoughts, whether he still believes the boy is Prema Sai. He starts by quoting Sankarcharya, that there are births and deaths again and again. It’s an authentic statement. Sathya Sai told many devotees he’d be born again and he declared he would be born in that village. Even foreigners believe in Prema Sai and come to India looking for him. 55:17, Narendra is asked what he finally thinks. He says the boy should be taken to a safe quiet place then he’ll be OK, otherwise left like this to be influenced by people who come to worship him and coached by the Manipur devotees, can’t tell what will happen. The newslady ends by expressing fear what will happen as he grows older. All needs to wait until he is 9 years old, right now there are no answers to the questions and no foundation for belief of Prema Sai being born again as the boy Preetam. This entry was posted on June 10, 2015 at 10:04 pm	and is filed under Sathya Sai Baba. Tagged: Doddamalur. Telugu TV9, Prema Sai child. You can follow any responses to this entry through the RSS 2.0 feed. You can leave a response, or trackback from your own site. And if you are still not there yet ( in terms of perfection)- LOL well then…need i say more? If we are not perfect we have no right to critizise others…. There is enough bad out there…lets try to be a positive influence rather than spreading negativity. Lets be humble – we were only born yesterday…life has been going on well before we came into play and it will continue well after we are gone. We ain’t no messiah. Let’s not try to act like one. Yeah? You are not in a position to advise me, I think, with your simple idealistic faith, but certainly too little experience of life and the world. I was once a young idealist, now I am soon 80 and have visited over 60 countries, having lived in four of them. I have been in three professions (university teacher the main one) and have been involved in spiritual movements and a guru since the early 1960s and was for 18 years from 1984 the leader of Norway’s Sathya Sai Baba organisation and continual voluntary service work. However, because of what I learned after many years, it became incumbent on me to spill the beans on Sathya Sai. I had promoted through many articles in his journal, plus a book in 1984 (blessed by him). After I had investigated his heinous crimes and deceptions because of vulnerable (and, like you, naive) people I had to speak out. Since I did in 2000 I have been inundated for 15 years by mails and contacts from many hundreds of people who have told me more of the breaks of trust and various quite horrendous things he has done to devotees. I have informed, supported and advised many where possible. The world is full of people who are too self-interested, greedy for the wrong things and untrustworthy… Pedophiles are one of the worst phenomena of modern times (in Western countries, and in India and other backward cultures massively so). Sai Baba is still being promoted in India (through hardly at all elsewhere) as a ‘spiritual’ person, a god, the creator of the universe and what have you. But you expect me not to ‘bad mouth’ him! One cannot let massive deceits, despicable lies, bribery, and most serious crimes go unmentioned. I first sent this by e-mail intending not to publish the comment and my reply because I know this can ruin a reputation on-line. However, the e-mail address submitted was false, possibly intentionally. The IP locates the sender in Adelaide, Australia, and the comment’s English shows the person is of Indian ethnic origin. It seems likely that the correct name is Soumya Bhaskara (not bhasksra).